New Year’s Resolutions… I’m only 5 days late (did anyone else feel like the holidays stretched out until yesterday? ), but that delay has given me plenty of time to think about these things we commit to doing. You know, the ones we are determined to accomplish: weight loss, cleaning, and a million other habits… but we simply can’t sustain them. Don’t get me wrong, I love a good commitment and challenge, but I think there is also something to be said for needing ways to sustain and complete the goals we set out to accomplish. Like an uncluttered home. 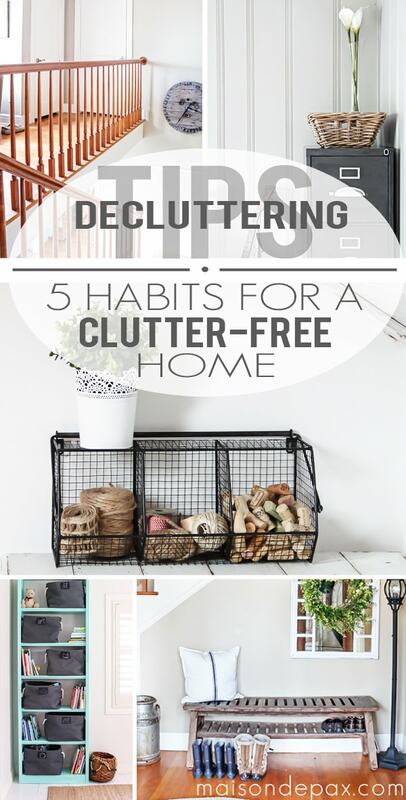 You can try all the millions of tricks for cleaning out every drawer and closet, but if you don’t have a system in place to continue a healthy habit in your home, the chaos can creep back in no time at all. I think there are two major areas of decluttering: habits and function. It’s not just about how much we can throw away (though that’s nice, too), but rather about our entire mindset and the structures we have in place to help us. I started with 10 decluttering tips for your home, but this post got too long! 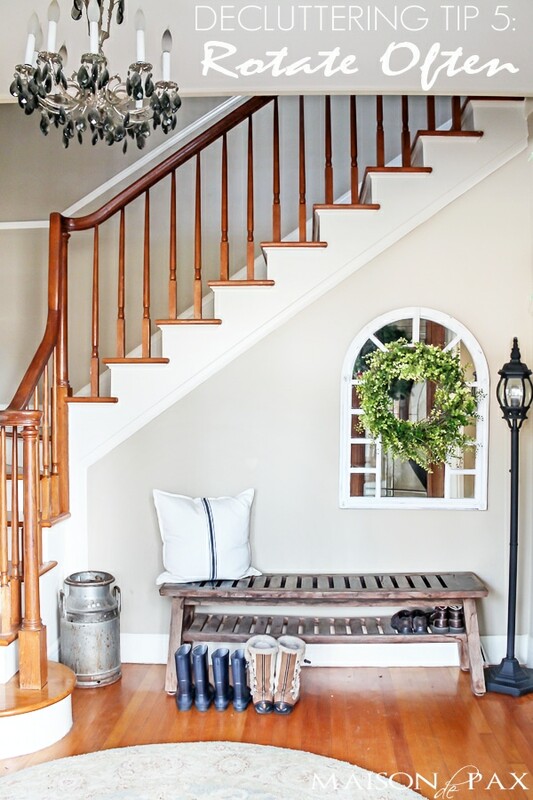 So today, I’m sharing 5 habits to help you keep an uncluttered home. Come back Wednesday for 5 more suggestions. 1. 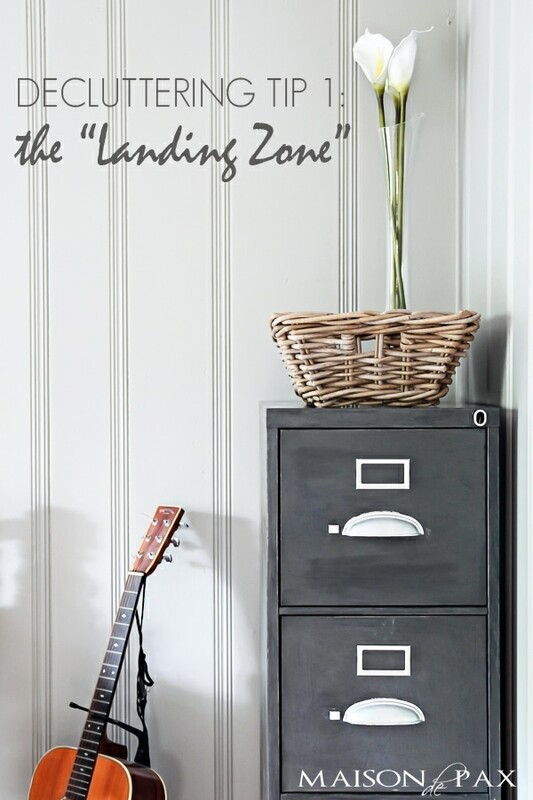 Have a “landing zone” for things you (and your kids) bring home. Now I don’t mean groceries or even purchases, necessarily. I mean the candy cane painting from preschool. Or the paper kite they made with their grandmother. These things are fun and wonderful, and if they will continue to enjoy them, great! But chances are, if you put it out of sight, they will completely forget. If I saved every single piece of artwork my children ever made, I’d be drowning in it! When my children aren’t around, I put things in the basket on top of the file cabinet in my office, and my rule is that if they haven’t asked about it in a week, I can throw it away. Now don’t count me heartless, I save some special ones, and I take a picture of some for memory, but we don’t need 80 million construction paper crafts in our home. No thank you. 2. Set space limits: 1 in? 1 out. Do you have a walk in pantry… Or a cupboard? Is your playroom 20’x20…. Or is it one corner of the living room? Either way, the space you have is the space you have. Decide what you can accommodate and stick to it. For us, it takes on a “1 in, 1 out” method. Each time I get a new shirt, I try to give or throw another one away. After Christmas? We cleaned out a similar amount of toys to give away. I know this can be hard when you are keeping the baby toys for younger siblings to use, but I assure you that it’s still worth it. Truth is (and for what it’s worth, my kids are 7 months, 2 1/2, and 4 1/2… I know the temptation to keep things around for the next child! ), the little ones want to do what the bigger ones are doing anyway. One small collection for each age group is plenty. My baby’s favorite toys are tupperware and her brother’s blocks. 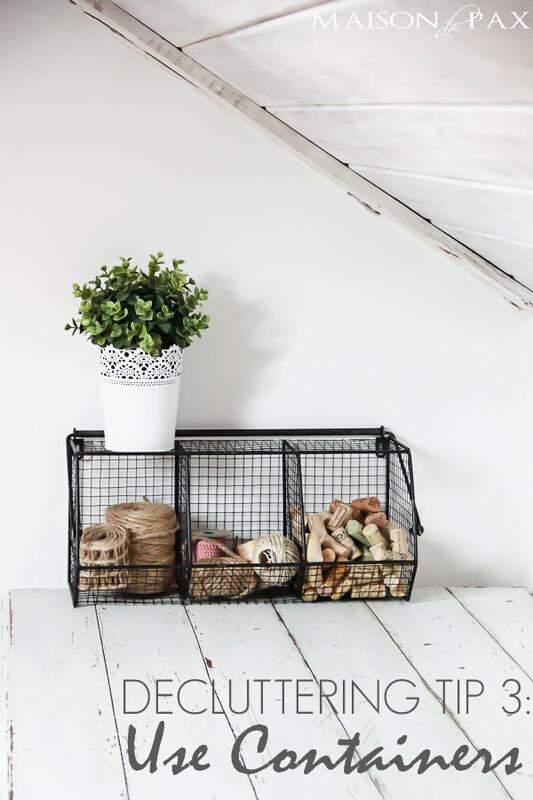 Boxes, bins, buckets… anything to corral clutter. It may seem counter-intuitive because it allows you to hide the mess. And to some extent, that may be true. However, I find that boxes and bins help me keep our things manageable and organized; they enable me to follow the “1 in, 1 out” rule because I can tell what needs to go for something else to fit. Plus, they look pretty… Win! For more ideas, see these tips for organizing with pots and boxes and these tips for organizing the playroom with bins. 4. 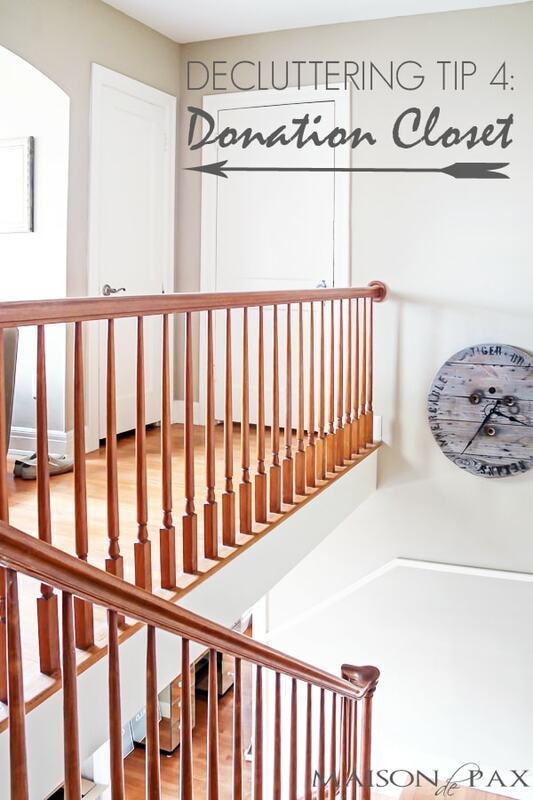 Have a permanent donation spot in your home. Growing up, it was the floor of the front hall closet. My mom always kept a trash bag there, and anything we were ready to give away went in the bag. Every few weeks, she would drop it off at Goodwill. In our home, I use the floor of my linen closet. Not only does this encourage generosity (I help my kids put things there that they think someone else would enjoy more than they do), but it acts as a “landing zone, ” too. Sometimes it’s hard to bring ourselves to throw something away, but putting it in the donation pile is non-threatening because we can always go get it a week later. However, if I go for a month or two without going to retrieve it from the pile, then I feel much better about letting go of it. I find we can do without so many things if they are simply out of sight! Whether it’s toys, clothing, or decor, rotating things often can help you avoid that item that just takes up space and is never thought of. You know the one, the dress at the back of your closet that you haven’t worn in 5 years (and has no business being there!). Or the mirror that you kind of hate but it’s hanging on the wall where it’s always been because it’s always been there. Or the Candy Land game that your kids don’t really like. Whatever “it” is, rotating things around will keep you from filling up your home with things you don’t use. It might even help you enjoy something more! That clock hiding in the upstairs hallway might be perfect in your daughter’s room. Or Candy Land might just be the thing your children have been waiting for on a rainy afternoon. Be sure you rotate regularly so you don’t forget and waste what you have. So there you have it. 5 simple, regular habits to help you keep the clutter away. What’s your favorite anti-clutter habit? Update! 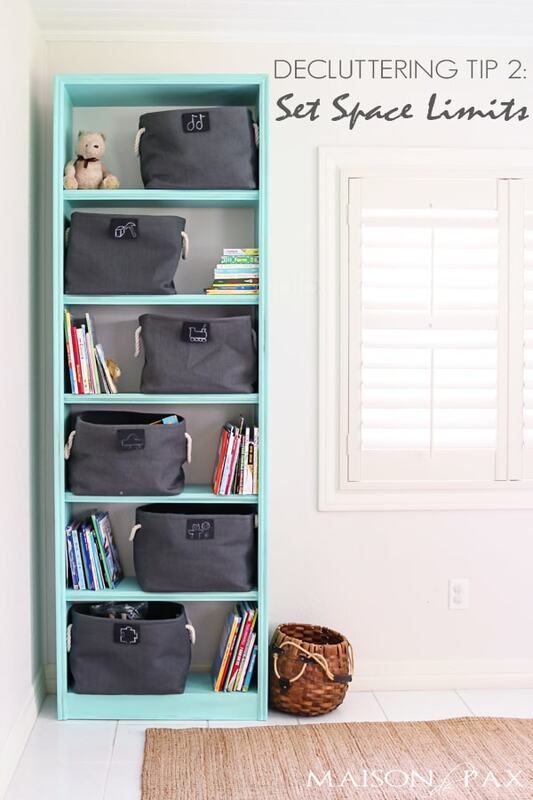 Be sure to visit part two of this series: 5 Functional Storage Suggestions. Thanks for the tip and they will help. #4 is brilliant!!! I am purging stuff right now and I will create a closet so that this becomes an easy habit. Thanks!! You’re so welcome, Jenn! So glad you found it helpful. 🙂 Happy New Year! Great tips! The donation spot idea is perfect!! I am so bad at this! I tend to try and keep every single thing I’ve ever owned… it’s like their little friends that I love and hate at the same time! I’ve definitely been trying to get rid of things that I don’t love but it seems like no matter how many useless items I usher out the door there are still fifty more things left hanging around! My “donation” pile has become 1/4 of the garage! The pile just keeps growing! I really need to start using your 1 in 1 out rule… but I’m just not sure I have the backbone for it! It’s SO easy to hang on to things, Betsy! That’s why I have to force myself to use the one in one out rule. 😉 It sounds like you’ve made a good start, though. Good luck with the next steps! I especially love the canvas totes with the chalkboard labels. Where are they from?! Thanks, I’m so glad you like them, Allison! I got the bins from The Container Store here. We have loved them! I’m so glad to hear it, Gaelle, and thank you! It is amazing how quickly those things can add up, isn’t it? The second set of tips can be found here. I hope this helps!! Thank you for your tips. Like your site they are really nice. I practice much of what you’ve written about … I actually love de-cluttering and purging … it’s very liberating! I actually follow a “1 in/2 out” rule. I find that as time goes on, I can make do with much less. True gifts come with no strings attached so if you don’t love it, get it into the hands of someone who does or will. I LOVE your tips encouraging donating- that’s a Win-Win for everyone. Thank you, thank you. Where is the bench from in that last photo? Or where is the original photo from? Thanks! It actually came from my grandmother! She claims it was originally Pier 1 years ago, but I admit she’s not always good about details like that… 😉 Sorry I don’t have a firm answer.